Land is a lattice-work of variegated browns in this photograph of the Florida Keys, with abruptly rigid grey human-built structures. The iconic and inviting blue waters darken with depth, with splashes of swirling bright aqua where sediment is stirred up to the surface. 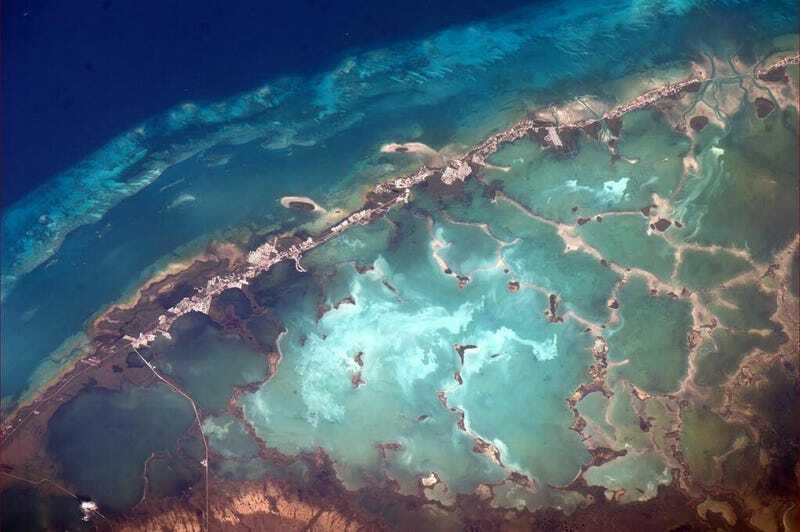 Off-shore in the upper left, the coral reefs that make the Keys such a popular scuba destination are a submarine band of irregular structures. To the lower left, a causeway links one key to the next, an artificial tie between the islands. Within the lagoons, the white sand beaches dissolve into the water, creating swirls of sediment-laden water. The increase in sediment can concentrate nutrients, leading to phytoplankton blooms. Luckily, the sand is concentrated within the lagoons, otherwise the settling muck could burry and kill delicate offshore corals. Image credit: NASA & Astronaut Rick Mastracchio who snapped the photograph from the ISS on Sunday afternoon. For a broader view of the Florida Keys, check out this Earth Observatory photo-of-the-day from 2001.